Home > SpecV > Spec V - 7:20 at Nurburgring ? 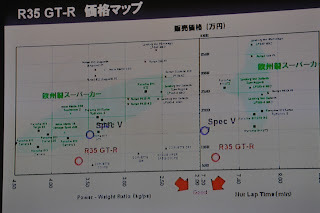 The rumors are that the Spec V Nissan R35 GT-R will be able to turn a lap time under 7:20 seconds at the Nurburgring. No matter what it actually turns, every Porsche guy, Corvette guy,and Viper guy will deny it. The Spec V will be a tube frame race car on slicks, piloted by aliens, with a gas turbine under the hood. I heard that the Spec V official Nurburgring lap times were not going to be released. Rather Nissan was going back to the ring with their updated 2009(2010MY US) GT-R. Best Motoring tested the 2008(2009MY US) GT-R vs the 2009 GT-R and found it to be about 5 km/hr faster though corners. Nissan says for the performance of the Spec V compared to its European rivals, the car is still a relative bargain. 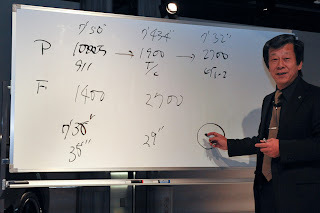 The whiteboard is used to show Porsche and Ferrari Nurburgring lap times and prices. 7:50 for the 911 . 7:43 for the 911 . 7:32 for the GT2. The Spec V has 80 seconds of overboost,carbon brakes, 132 lbs lighter , and a titanium exhaust. A link to a translated version of Car Watch. Hey, to all the people that have that kind of money at their disposal.. It should be worth it.. Please post this to show all GTR lovers thats the ZR1 Nurburgring time was faked by GM...Please post it, the true must be told!